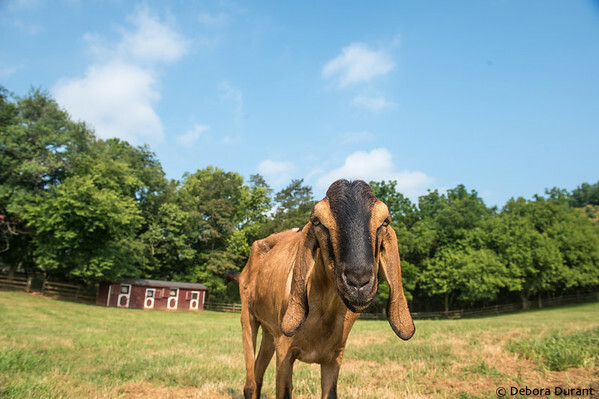 Rocky is one of the sweetest goats. He came to us when he was found, abandoned, wandering along a highway. He has some kind of disease that will cause him to get arthritis early. It’s possible that he was abandoned on the side of the road for that reason. He loves attention, and if you scratch his back in just the right spot, he will wag his tail! Patty and Paige came to us 13 months ago when they were just a few months old. They were found as strays (!) in DC. Here’s a video I found from when they first arrived! We don’t know their stories prior to being found as strays, but there’s something about the bond that pigs form when they arrive together, they tend to stick together for much of their lives. 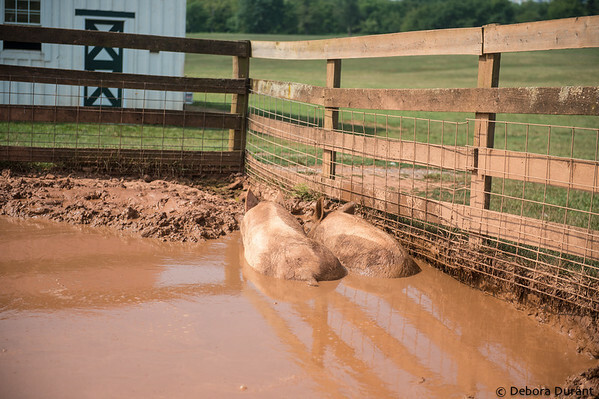 Last weekend the mud puddle was pretty healthy, and there were several pigs lounging in it, enjoying themselves. Patty and Paige showed up, and though there was plenty of room for them to have spread out, they chose to lay down right next to each other! Another group that came together, and have stuck together, are Sprital and his fellow Bantams, Lindy and Mindy. They were rescued after Katrina, found in a yard of a destroyed barn. Most of the animals had died in the storm, but Sprital and a few others were alive. They were brought to Poplar Spring, and they’ve stuck together ever since. 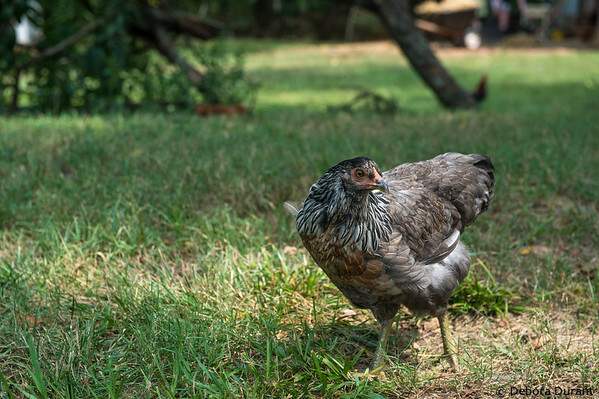 I often wondered if it was because Bantams are a miniature breed, thinking that they had a sort of sub-culture in the chicken society, but Alina – the little bantam hen who loves to be held (unlike the Katrina survivors) – has never really associated with Sprital’s group. Nine new hens arrived last week from a hoarding situation. The woman who had been keeping them in her backyard ended up in the hospital unable to care for them any longer. 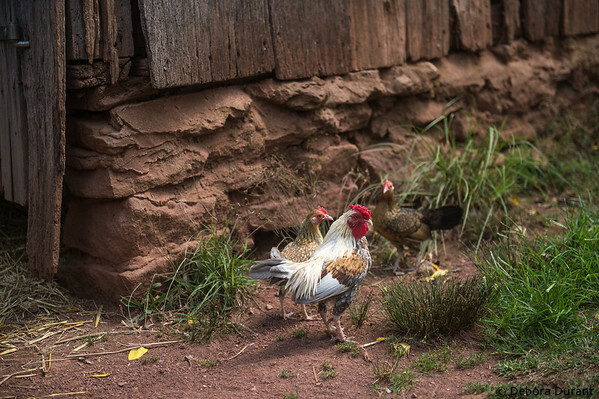 They went from a small (and apparently very dirty and ill-kept) enclosure, to the sanctuary’s chicken yard with all that grass and dirt and bugs and other chickens. It will be interesting to see if these nine tend to stick together! I’m really glad that the Open House is coming up in a couple months – on October 7th – so I’ll have a chance to ask Carole and Ziona, the weekday staff in the chicken yard, about where the nine new hens end up in the social structure! Hopefully by then I’ll know their names too – that gives me about 6 Saturdays of asking Terry each week! Dave named the nine new chickens “The Pugsleys.” That’s probably how I’ll always know them because I’m never down there enough to learn many names. He didn’t really name the group “The Pugsleys.” He told you that you and Leesa could call them that if you wanted, to get that name out of circulation, because no one else likes it and you guys wouldn’t let up about it! For some reason… Maybe its the sepia tones – But the photo of Sprital, Lindy and Mindy remind me of a vintage postcard. Totally precious – Thanks for sharing!